As with all history the reliance on memory often leads to conflict, even with one person's recollections. Compare these quotes from Mark Evanier, in relation to how Jack Kirby worked with Stan Lee. MARK: I had lunch with Stan Lee a couple weeks ago and we spent hours talking about that. Jack kept tons of Stan's old plot outlines, so I have a pretty good picture of how they worked together. I have some of Stan's old plots and notes. DAK: I have, a copy of the plot for FANTASTIC FOUR #1. MARK: That's great. I have AVENGERS #4. DAK: It turned up in the office when Roger Stern was cleaning and I xeroxed it. The outline, the bare bones of the story is there. It seems to indicate — whether or not it was done afier a conference with Jack — that Stan did actually give him a plot. Generally when you see a latter day quote from Jack Kirby about Stan Lee they're not that kind or gentle. 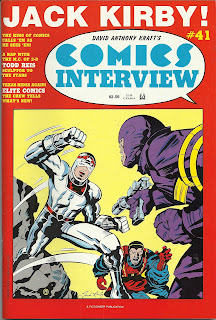 At the time when this interview was done Jack was fighting Marvel to get his artwork back (and despite what Jim Shooter might want to say to the contrary, Jack Kirby never brought legal action against Marvel as a bargaining tool - seriously Jim, prove it with some solid evidence and not just your word) and wasn't in any form of a contrite mood towards Marvel or Stan Lee. With that in mind, the following excerpt from the interview is a bit more revealing than you'd expect and it does go a long way to dispel the popular myth that Stan and Jack were fighting until the end. As meetings go this one sounds fairly happy, all things considered. 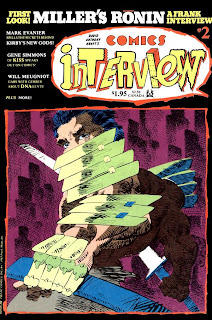 The interview was done in 1986, the interviewer was Mark Borax. If you're serious about commissioning artwork from serious artists, then you shouldn't be going past Trevor Von Eeden. There's many, many words I could write about Trevor, and indeed I have, but this time I'm going to let the visuals tell the story. My original brief for Trevor was for him to recreate the cover art to the famous Batman Annual #8, originally drawn by Trevor and painted by Lynn Varley. Along the way Trevor changed his mind as to what he wanted to do and told me that he wanted to impress Lynn. To this end he decided to do a full colour commission, with coloured pencils only - no paint - and scanned it in stages. I never saw the in-progress scans, Trevor wanted me to be impressed by the finished product, which, as you'll see, is breathtaking indeed. And yes, I was, and still am, highly impressed. Did Trevor improve on what Lynn Varley originally did? You make your own mind up.